It was like a breath of fresh air, hearing Her Excellency — Dr. Cecile La Grenade, our new Governor General, in her inaugural address on Tuesday May 7, 2013 declaring her commitment to the protection of our built heritage with special reference to the restoration of the Governor General’s residence and York House, which were severely damaged by Hurricane Ivan in September 2004, and remain derelict up to this day. UNESCO preamble to Heritage Protection 1972. Of course, there are several other heritage buildings and sites in our Capital City that have been neglected/ abandoned over the years, a few which come to mind are the St. George’s Market Square, which is undergoing some very insensitive changes, the Anglican and Presbyterian Churches, Edinburgh House on Young Street, the Georgian House on Church Street with an authentic Sedan Chair porch, which is in an advanced stage of decay, the reclaiming of Fort George, and within recent times the abandonment of the Public Library building on the Carenage. Talk is cheap. In Grenada and in the Caribbean as a whole, there is a culture, where once the matter has been thoroughly verbalized, it becomes a substitute for action (achievement). The end result is that there is little or no improvement in the matter at hand, until it is completely forgotten, and stagnation becomes the order of the day. It is imperative therefore, that the G.G. select her advisors carefully, as the naysayers would want to dissuade her into accepting that York House and the G.G’s historic residence and site should be replaced by so-called modern buildings. Unfortunately this mind-set is the result of a deficit in the knowledge and appreciation of our history and cultural assets which are essential ingredients in our evolving Caribbean identity. In conclusion, the Sentinel would like to think that this is an appropriate occasion to remind the powers that be, that there is no PUBLIC ACCESS to the Louis La Grenade mausoleum at Morne Jaloux. The mausoleum is the site of the remains of one of Grenada’s outstanding sons and heroes during the FEDON revolutionary period, and a deceased relative of our Governor General. 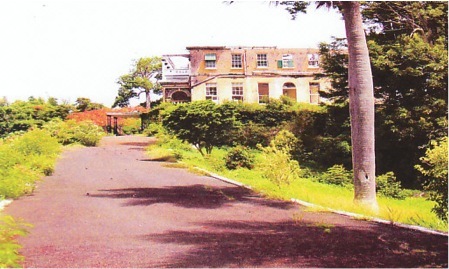 The Sentinel is therefore looking forward to the day when public access to the site would be restored in order to reinforce the meaning and appreciation of our heritage for both Grenadians and visitors alike. Finally, the Sentinel takes this opportunity in wishing her Excellency, “God’s speed,” in the tremendous task of nation building which lies ahead.